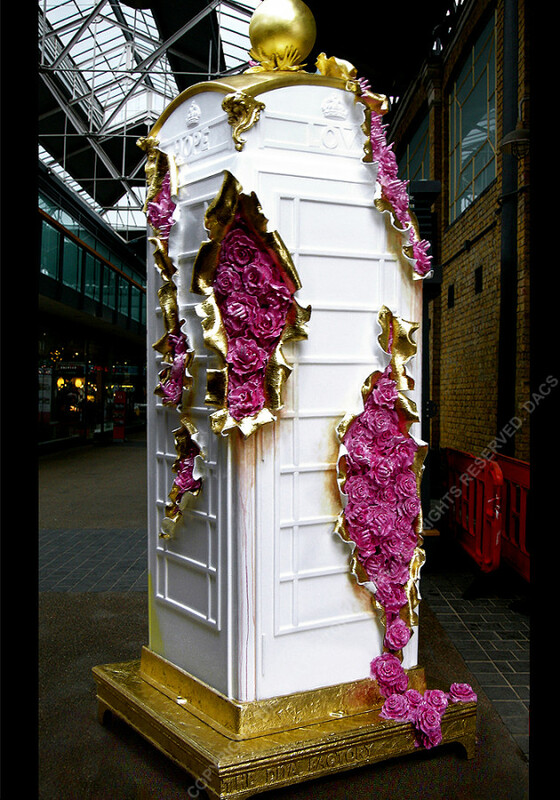 THE DnA FACTORY MRSS were invited to contribute to the BT/ChildLine charity event, ArtBox, with artists and designers re-imagining the world renowned red telephone box designed in 1936 by Gilbert Scott. ‘The Poetry Of Life’ took up residence in Old Spitalfields Market and was later auctioned, along with a selection of 25, at a gala event held at the National Portrait Gallery. Contributors included Duggie Fields, Keith Tyson, David Mach, Zaha Hadid, Zandra Rhodes, Giles Deacon & Philip Treacey. THE DnA FACTORY MRSS contributed to the charity event, London Cow Parade. Milk Ma(i)de was placed in prime site at The Royal Exchange, just outside Tiffany’s, went on to feature in The Telegraph and Hello, was voted ‘best in show’ and included in the selection auctioned at Sotheby’s Olympia, rumoured to have been bought by Madonna, Milk Ma(i)de raised a considerable sum for the charities involved. 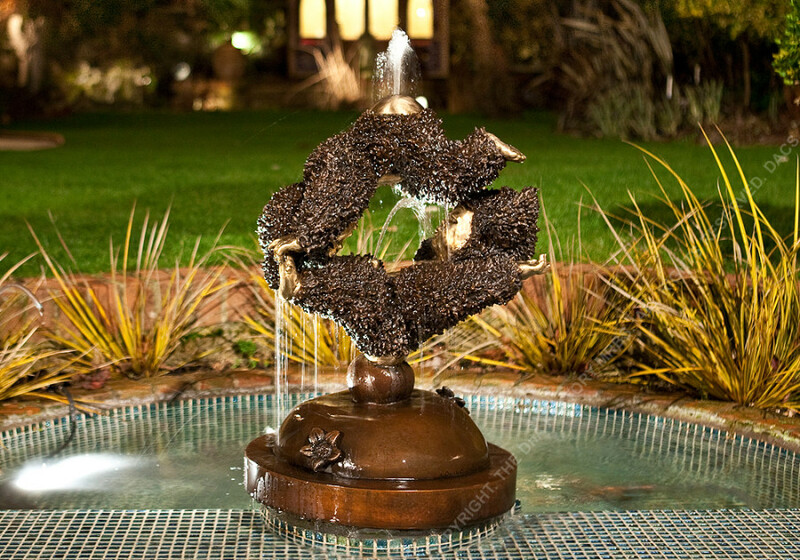 The subsequent commemorative figurine was on the best seller list for Cow Parade collectors and enthusiasts. 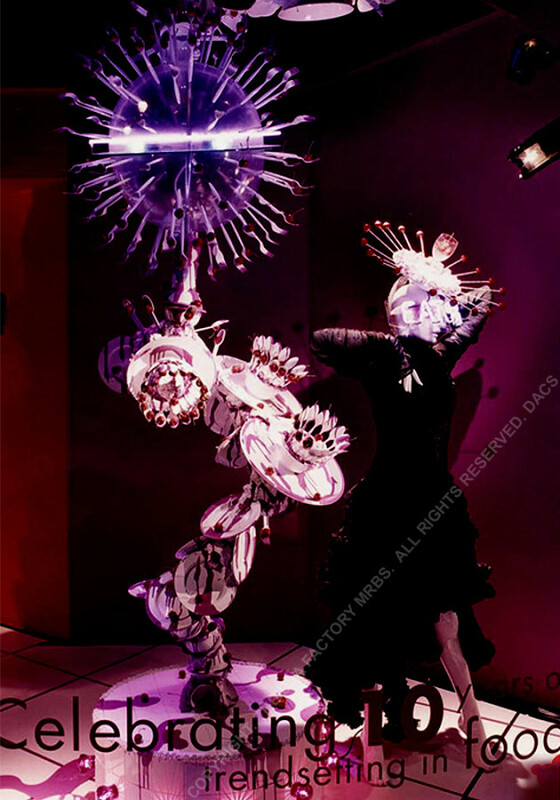 THE DnA FACTORY MRSS are one of the few artists given the freedom to design, build & install the entire run  of Harvey Nichols’ windows at the flagship Knightsbridge store. 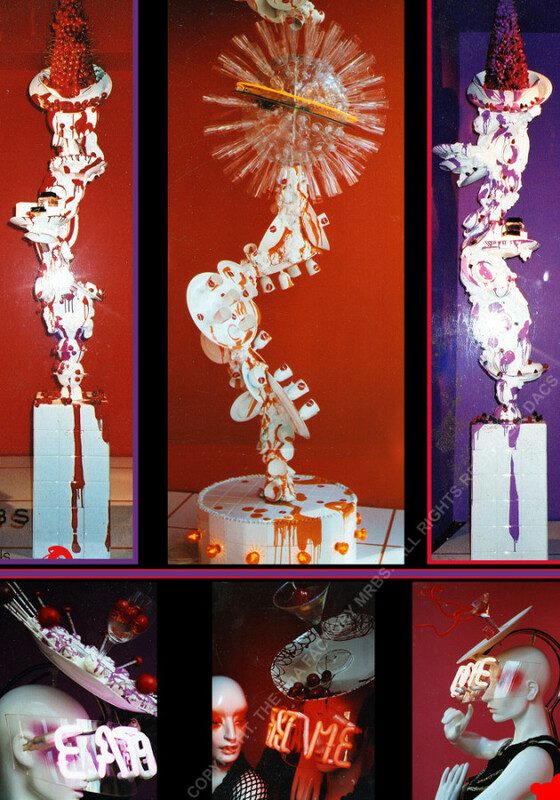 The resulting installation of tornadoes of china, glassware, cutlery, fruit topped with huge cakes, neon symbols & strobes placed this in the top 5 displays of the year. The installation featured in The Face & Boy George performed within the windows. Neon vizors & insane millinery were also designed by the THE DnA FACTORY MRSS. This scheme proved hugely influential over the next few years, indeed to this day, with designers in many fields adopting the imagery. The installation was to celebrate 10 years of food & fashion, the fashion by Marc Jacobs. THE DnA FACTORY MRSS were invited to exhibit in the amazing Platform 6 exhibition created by James Tailor and held at The Bargehouse behind the OxO Tower. The exhibition also included a charity auction in support of Stonewall with the contributing artists and a clutch of celebrities modifying a pair of classic Stan Smith Adidas trainers, contributors included Kate Moss, Naomi Campbell, Sir Elton John, William Baker, Rolina Blok, Ryan Callahan, Kyle Minogue, Lewis Burton, Sharleen Spiteri, Layla Lyons, Judy Blame, Boy George, Victor Ivanov, The Chapman Brothers, James Tailor & Carl Hopgood.